BTD found these on twitter. The feed of caitieparker. Good Morning America is already onto her. 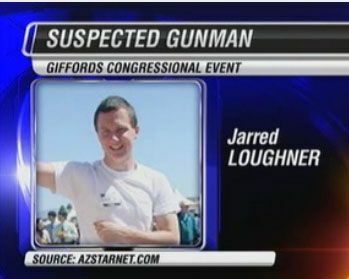 22 year old Jared Lee Loughner is the suspect in custody in the Tucson, Arizona shooting of Rep. Gabrielle Giffords this morning. Here's his You Tube channel. He calls himself Classitup10. He favorited this video,which begins with a breathy voice saying "Let the bodies hit the floor."